Like most Minnesotans, Peter Schultz was raised on home cooking infused with butter and lard. Well, maybe not quite like pop – but almost. “It’s part of the culture of living in Greece. It’s everywhere,” he rhapsodizes. Twenty years ago, he was a young Minnesota native in love with everything Greek – working on his doctorate in classical art and archaeology at the University of Athens. 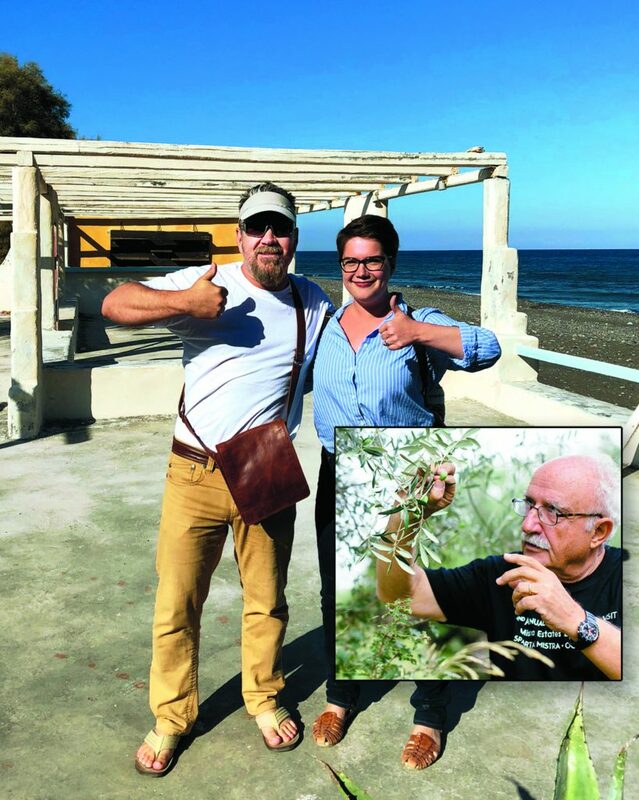 He’d spend long, hot afternoons talking with his friend Eugene Ladopoulos (Mr. Lado), the husband of his dissertation adviser, whose family owned an ancient olive orchard near Mistras. Over half a dozen ensuing years, while Peter explored the timeless archaeology and modern ways of the land he’d come to love, the two men talked from time to time of Mr. Lado’s dream of selling his extra virgin olive oil – EVOO – in the United States and Peter’s eagerness to share his discovery with his friends. The American returned to Fargo-Moorhead, where he’d earned his first degree at Concordia College. As the Olin J. Storvick Chair of Classical Studies, he began leading annual student trips to explore Hellenic culture. Finally, he decided to take a chance and share his love of the ultimate oil with his friends in Minnesota. But his confidence in the almost-magical oil from those old trees prompted him to carry on. As a professor of the classics, he organized annual student trips to the Peloponnese, expanding the pool of believers who developed a taste for the fresh-pressed oil so omnipresent in Greece. As the business grew, he was joined by Cady Rutter, who’d first accompanied the student journey in 2013; today they work side by side, with Cady handling imports and the low-key Mediterranean travel tours they’ve continued and expanded. Peter is downright passionate about the differences between his lovingly nurtured Mistra Estates oil and the bottles crowding the shelves of American supermarkets. “There’s no comparison with the commercial product,” he asserts. For one thing, he says, recent research has revealed that 70 to 90 percent of commercially bottled so-called “extra-virgin” brands are frauds. Peter Schultz, Importer – as the oil project is known – is perhaps less a business than a labor of love. There’s no advertising at all; to be included in next year’s once-a-year ordering season, aficionados send an email to get on the mailing list. Other ideas are percolating, too. Peter has talked with other Greek friends whose orchards might add variety and new tastes. He’s talked about importing the olives themselves. After a trip to Costa Rica, he has begun working with a similar farm operation run by a woman who grows and roasts her own beans on a small farm right below the Monteverde Cloud Forest. “Amazing coffee … just incredible,” he reports. He may import some of her harvest, too. Now a visiting scholar in the North Dakota State University Department of Visual Art, Peter continues to think up new projects as he pursues his professional research and writing and other deep interests like the Longspur Prairie Fund, which focuses on prairie and wetland restoration. With Cady’s help, he also hosts three or four tours a year to his beloved Greece and surrounding areas. For information on ordering Peter’s Mistra Estates olive oil and other products, visit peterschultzimporter.com.